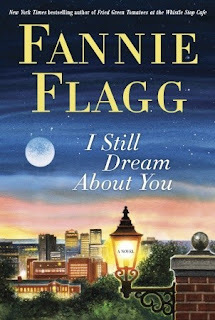 Yet another book I found in my office while waiting for my list of requested Kindle library books, I Still Dream About You by Fannie Flagg was a delightful read that I'm using for the 24th category - a book based entirely on its cover. What started out as a book about a woman planning to end her life ended up as a wonderful mystery solved, and a whole lot of good news for good people. Maggie thinks her life, spent mostly with her co-worker Brenda and thoughts of her regrets from her past, isn't going to get better, and has really passed its high-point already. She considers it a service to end it now, before she's a burden to anyone in her approaching old age. Without giving too much away, after several humorous side-trips as she tries to meet her goal, she sees another light entirely. Her life, and the lives of those close to her, become more of what everyone deserves. While I wouldn't have expected a book originally premised on a planned suicide to be quite so enjoyable, I'd highly recommend this book as a way to pass the time, and an uplifting view of what could be, if we just keep pushing on. Well that's an interesting premise, but it sounds like it might be a funny read in the end. I sometimes pick books based on the cover. Sounds like a good book! This is a different plot than I would normally go for, but it does sound like a very interesting book - I'm intrigued!